Here it is New Year's Eve and I've been busy making Valentine's cards, what's up with that?? Here's another creation I made with the Love You Much bundle. It's for a monthly swap that I do with some fellow Stampin' Up! demonstrators. Here's wishing everyone a safe and Happy New Year! Take time to enjoy your loved ones. I really love seeing how you 'put it all together.' I love the color combo in this card. 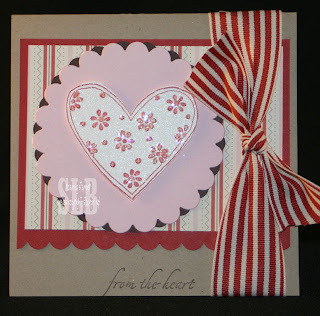 That ribbon really makes this card-well that and the glitter!! !